Paul E. Griffin, Jr. is the fourth generation of the Griffin family to be involved in the home building industry in Southern California. Beginning in 1903 and continuing today, the Griffin name has always been associated with innovation, quality and customer satisfaction. In almost 100 years, five generations of Griffins have produced nearly 30,000 homes. Paul began his career in 1954 after returning home from Korea, where he served as an Officer in the U.S. Air Force. 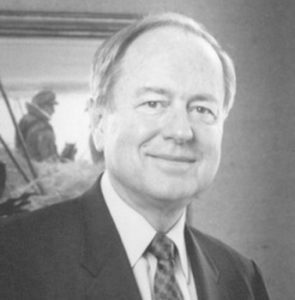 He became President of Griffin Homes, his own company, in 1966. Under his leadership, the company grew into one of the largest home building organizations in California. The success of Griffin Homes resulted from a number of important strategic business decisions made by Paul. Three of the most important included a strong commitment to the communities in which he built, a focus on quality, and an emphasis on providing lasting value to every Griffin Homes customer. Paul sought out innovative architects and charged them with designing unique homes that exhibited features and amenities not usually found in the affordable new home market. Along with designing attractive residences, Griffin Homes continued to utilize quality building materials, seasoned subcontractors, and put an even greater emphasis on customer satisfaction. By the early 1980's, Paul had established a comprehensive quality assurance program at Griffin Homes that was second to none in the industry. As a result of those efforts, the company received top ranking from National Survey Systems for customer satisfaction. Paul's management style and business philosophy served Griffin Homes well. The company was consistently considered to be one of the most prestigious family-owned Southern California builders. It was consistently named to the Builder 100 by Professional Builder magazine. By the 1980's, Paul's company was averaging revenues of $200,000,000 annually. Long before environmental issues became a public concern, Paul was working closely with city governments to develop new home neighborhoods that complemented the surrounding community and exhibited a real concern for the area's natural resources. Building parks, setting aside green space, and helping to provide for new schools have always been part and parcel of Paul's concept development. In fact, Paul was rewarded for his commitment to the communities when Moorpark College named their football stadium after him. As a 40-year member of the Building Industry Association, Paul was a founding member of their Governmental Affairs Council. He is a Past President of the Los Angeles/Ventura Building Industry Association. He has also served as a Director of the BIASC, the National Association of Home Builders, and the National Housing Roundtable. Paul's work has achieved numerous industry honors for excellence including Elan Awards, MAME Awards, National Association of Home Builders' Best of American Living Awards and Gold Nugget Awards for architecture. One of only a few Americans to be a Knight Commander of the Order of Saint Gregory in 1993, one of the highest honors bestowed upon laymen by the Catholic Church. Member of the UCLA Board of Visitors​Well known for his fund raising efforts and charitable contributions to his alma mater, Paul and his wife, Gloria, have given major support to the UCLA Medical Center, endowed a chair in Moral Philosophy at UCLA, made a major gift for the construction of the Newman Center and were the primary benefactors in building the UCLA Athletic Hall of Fame. These contributions were in addition to the support given to the Engineering School of which Paul is a graduate.